So far in Iraq nearly 4,500 US troops have died and over 50,000 Iraqi civilians (conservative figure). Click here for details. Yesterday Malian civilians sang the name of French president Francois Hollande as yet another city became free from Islamic oppression. The French president will hand over to African forces once sovereignty of Mali has been restored to the Malian government. When the French troops are gone, the aid will continue, financial aid and the restoration of cultural and historical sites damaged my the Islamic militants. In comparison the US in Iraq which started in 2003 seems to go from wore to worse, despite the fact that combat troops officially left in 2010 there are constant bombings and attacks. The US bombed the crap out of Iraq, went in, overthrew the government, killed thousands of civilians, contracted the rebuilding to US companies and left. Who is Iraq sings the name of Bush or Obama? This entry was posted in Anti-War, Daily headlines, France, Iraq, Mali, USA and tagged African forces, civilians, France, Francois Hollande, George Bush, GW Bush, Iraq, Iraq war, iraqi civilians, Islamic militants, Mali, malian government, Middle-East, Obama, politics, USA on 03/02/2013 by Leon J Williams. Following on from North Korea’s successful satellite launch last month the UN has imposed more economic sanctions. In response to this action North Korea have upped the ante by threatening to conduct more nuclear tests, targeted at the US. The US and North Korea have major trust issues with each other and both are justified in this. North Korea is a family run dictatorship that has attacked South Korea before and the US is to date the only country that has used nuclear weapons killing almost 250,000 people, men, women and children. The US has also been to war with more countries that anyone else since the end of WW2. So will the Korean War of 1950-53 (which has technically not ended) resume? Who will strike first? And which countries will get involved? The US could see this very real nuclear threat as an opportunity to finish off the previous failed attempt to take over North Korea and remove its leadership while gaining the backing of the UN. Japan, which is a big supporter of the US and vehemently anti-North Korea could be on hand to lend some support though their role may be limited to logistics. In support of the North, last time around, China came to the rescue however China has also started to voice concerns about the North. While it’s possible that China could decide to remain neutral should war break out. I would say that it’s more likely that China will send in the troops again seeing that being given a choice between Kim Jong-un or the US on their border they will choose Kim Jong-un. Last time around Russia lended some support to the North, mostly aerial, I think that this is less likely (but still possible of course). Things politically have changed in Russia since the early 50’s and support for the North seems to be over (at least compared to then). Well much like the last time it all depends on China, if China supports the North with military fire power and troops on the ground a win is possible for the North and Korea will once again be united. If China doesn’t get involved then a South Korean/US victory is certain and the country will also be united again. Either way, just like the last time war broke out on the Korean peninsula, millions of people would be likely to lose their lives, mostly civilians. This entry was posted in Anti-War, Daily headlines, North Korea and tagged Anti-War, China, DPRK, economic sanctions, Kim Jong-un, korean peninsula, Military, North Korea, north korea and south korea, nuclear war, politics, Republic of Korea, ROK, US, USA, war on 25/01/2013 by Leon J Williams. Since the economic crisis Iceland has been on the verge of bankruptcy, it’s banking sector collapsed followed by huge international anger at the government allowing their banks to fail, rather than as with the US and UK which bailed out those banks with taxpayers money. So since these times how have the three countries fared? I have taken a little look at unemployment, national debt and tax rates for Iceland, the US and the UK from 2010-2012. Iceland’s unemployment rate has fallen by 4% the most during this period and is the only country of the three whose overall tax has increased and is the only country whose national debt has fallen. Some will say this is clear that the policy of socialism of increasing taxes for everyone (not just the poor) works and in a sustainable way. Often the specific type of socialism is referred to as ‘Nordic Socialism’. Whether or not this is a form of socialism or not it should help put to bed the myth that the right-wing churn out that you must lower taxes so that businesses will employ people which will in turn reduce government debt as less people depend on the state. This entry was posted in Iceland and tagged 2010, 2011, 2012, bailout, banking, corporate tax, debt, economic crisis, economy, government, Iceland, income tax, national debt, Nordic Socialism, politics, Socialism, sovereign debt, tax rates, UK, unemployment, unemployment rate, USA, value added tax, VAT on 12/01/2013 by Leon J Williams. Back in early March last year I wrote about ‘Worker cooperatives‘ explaining briefly what they are and how they work. With the current ‘economic crisis’ that seems to never end in Europe and with the UK and US on the verge of a triple-dip recession I thought I would revisit the topic. Sometimes in life it can feel that we are all helpless, unable to control our own lives and destiny while governments and the corporate world dictate how things are going to be, businesses are going into administration at what seems an unprecedented rate and job security seems like a distant dream. It would seem that this is the perfect time for worker cooperatives to thrive, people banding together to secure their own futures without any dependence on the state or an employer. Have people forgotten what a worker cooperative is? Do people not know enough like-minded individuals? 1) People are so full of fear about their current plight that they have become paralysed, on one side they have a job that could go any day or they are unemployed with precious little money to risk and on the other there is the unknown with a society that’s screaming just take what you have and be grateful! 2) People have become so accustomed to the capitalist way of thinking that they would rather keep their jobs in the hope of maybe one day earning lots of money than they would set up a co-op with other people are share their profits. Maybe cooperatives are booming but are hidden away with the media not wishing to cover or have we become so selfish that we would chance it to make lots over stability shared? This entry was posted in Workers and tagged administration, business, capitalist, co-op, economic crisis, Europe, Ireland, job security, politics, society, triple-dip recession, UK, US, USA, worker cooperatives, workers on 11/01/2013 by Leon J Williams. A new US health report by the US National Research Council and the Institute of Medicine comparing the US to 16 other developed countries has once again highlighted the dreadful state of US healthcare. The report which compares mortality rates between the 17 countries places one of the richest countries in the world, the US, squarely last. Things are in bad shape (no pun intended) in the US and there is seems to be very little appetite to change things. In 2007 the UN reported on life expectancy for those born between 2005-2010 which placed the US 38th in the world, even lower than Cuba, Chile and the United Arab Emirates. America, lots of money, just in the hands of the very few wealthy while the vast majority suffer, long live capitalism! This entry was posted in Health, USA and tagged America, Capitalism, Chile, Cuba, health, healthcare, life expectancy, mortality rate, politics, report, richest countries in the world, Socialism, UAE, UN, United Arab Emirates, US, US National Research Council and the Institute of Medicine, USA on 10/01/2013 by Leon J Williams. Would you believe me if I told you Cuba is better than America? Cuba, whilst being blockaded in an attempt to starve them into allowing the US to exploit it’s people again, still provides more for it’s people than the US. In this short piece of writing, i am going to present to you facts, not opinions, because what can prove something more than a fact? Castro became prime minister in 1959, after overthrowing General Batista, who gained power in a military coup. In 1960, the Cuban government introduces aggressive economic reforms: American-owned businesses come under state control and the economy becomes centrally planned, this, along with the landowners having their land given to the peasants who have worked on it their whole lives, gets large amounts of support. With the lowest unemployment rate, which is at 1% and the highest literacy rate in the world at 99%, not to mention some of the best and most humanitarian doctors to ever walk the earth, Cuba would be a great country to live in. Unfortunately, due the US blockade, and the fact very few countries want to anger uncle sam, Cuba is still very much under-developed. Most of the Cubans who left were the rich ones, the exploiters, or as we leftists call them, the bourgeoisie. This would explain why the Cuban-American population is so well off. When Cuba is at its worst everyone still gets their food, water, and healthcare when America is at its best 40,000 people still die a year from not having healthcare. Why do the US want Castro out so badly? The US fear Castro, he has made socialism look successful, a rare case when “socialist leaders” actually turn out to be socialists. The fact they have tried to starve Cuba, invade Cuba, and assassinate Castro, (638 ways, according to a channel 4 documentary), shows they really don’t like how well Cuba is doing. Yes, the US claim Castro is a dictator, and that is why they want him gone, the real reason is he kicked US business out of Cuba, so it could benefit the people of Cuba, not the American government and fat cats. And if the US are so bothered about dictators, why did they give Pinochet bombers and munitions to take over from the democratically elected Marxist Salvador Allende, via a coup d’état? With the US foreign policy, you can see a pattern. Will it make us money? Do they oppose the US? Did they stop us gaining money at the expense of others? Are they socialist or communist? If the answer is yes, then the US will to something, whether it be the CIA training and arming rebels (Nicaragua, Afghanistan, which didn’t backfire at all…), assassinations, or starting a coup (Guatemala, Chile). In cuba, if you have cancer, you can’t get medicine to treat it. Why? The blockade. You can’t even get painkillers imported, for a headache. This is the inhumanity of the US embargo. It criticises Castro because Cuba does not have the same standard of living as the west, yet it is the cause of the problem. It’s like a slave owner, beating his slave, then berating the slave for not working as well. The US is clearly attempting to discredit Castro for the conditions it is creating itself. And for the “Cuba was better before Castro” argument: Kennedy admitted, after trying to invade Cuba, and assassinate Castro many times, that Cuba is better off under Castro than it was under Batista. 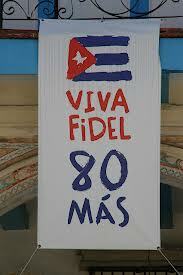 This entry was posted in Cuba and tagged America, Batista, blockade, CIA, Communist, Cuba, Fidel Castro, Hasta la victoria siempre, healthcare, literacy rate, Marxist, politics, Raul Castro, Salvador Allende, socialist, US, USA on 09/01/2013 by Leon J Williams. In the US state of Texas a school enforces a strict rule that its students must wear an electronic tag so that the school can know where their students are at all times on school property. This has been in force since the start of the 2012 academic year. The school in question is a Northside Independent School District (NISD) in San Antonio which hopes to expand the program right across their 112 schools. This operates in the same way as criminals on parole with the police tracking peoples every move. One student (Andrea Hernandez) who refused to wear this device was kicked out of the school, she took the school to court and of course the US authorities told her to wear the device or find another school. Looks like civil liberties in the US take another beating, eroding day by day. This entry was posted in USA and tagged America, Andrea Hernandez, civil liberties, education, electronic monitoring, electronic tag, electronic tagging, NISD, northside independent school, Northside Independent School District, politics, school, Texas, US, USA on 09/01/2013 by Leon J Williams.